GRAVENHURST — Five days and nights of fun. 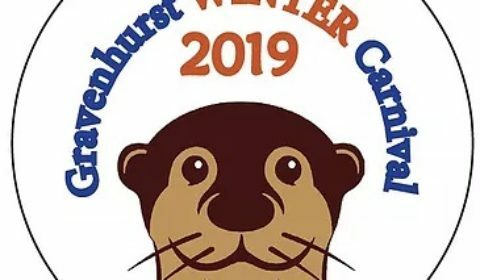 That’s this year’s 2019 Gravenhurst Winter Carnival. And Skokie has a ton of events to entertain everyone from Wednesday right through to Monday’s Family Day at the YMCA. Buy a button and pick up a brochure. The fun kicks off with “Skokie Talks” at the Opera House, an evening of Ted Talks put on by Ignite, in which local 20 guest speakers getting five minute each to show some slide and talk about them. Thursday night it’s the BIA’s Heat Up the Night, a downtown merchants initiative filled with horses, hot dogs, hot chocolate, fun and games. Friday, Saturday and Sunday it’s the traditional events, from wing eating and all you can eat poutine, to doggie dashes, log-sawing and nail driving, the bed races (you don’t actually have to race to win prizes, there’s best-made bed etc. ), polar dip and don’t eating at Gull Lake Rotary Park, lip-synching and dancing, Skokie’s Funland, Skokie’s birthday party, snow sculpture contest, vintage snowmobile display, plus the wreck-em race (Severn Bridge). Skokie (a.k.a. councillor Sandy Cairns) paid a visit to the pond hockey championships at the Muskoka Wharf Saturday to promote the carnival. Join Skokie for his Birthday Party and at his Funland. Skokie visited the pond hockey championships at the Wharf Saturday. Skokie teams up with players. Skokie’s a crowd favourite everywhere with all ages. Make your own poutine and enjoy all you can eat. $10 with Button and $15 without. Build a bed or borrow one of our beds and race your team as fast as you can on Muskoka Road! Teams consist of 4 runners/pushers and 1 rider! Adult and Children teams welcome. Teams must register. Owners and pets compete to see which doggie races fastest to the finish line. Owners call their pets and the dogs dash. It’s not about quantity.. it’s about speed! See how fast you can munch through a donut! Children only. Details for the evening: Horse Drawn Carriage rides by Twin Maple Farms with a Historical Tour by The Heritage Committee beginning in front of the Gravenhurst Opera House. Complimentary Hot Dogs & Hot Chocolate in front of the Gravenhurst Opera House (while supplies last). Cinnamon Cider, vegan treats and complimentary DIY Bath Salts & Sugar Scrubs at Shining Waters Soap Co.
An outdoor, interactive compilation of activities organized by the District of Muskoka’s popular EarlyON program that specializes in fun, stimulating and educational activities geared towards pre-school children but that are enjoyed by all ages. Contestants, who must be 19 years and older, will be challenged to eat the 1.5 lbs of chicken wings in 3 minutes. The contestant who eats the most weight will win an assortment of prizes. First, second and third place will be awarded. $10 with Button and $15 without​. The Muskoka Winter Carnival continues Monday, Family Day, at the YMCA and Graeme Murray arena for free pancakes, games and skating.